Wisdom of Life. 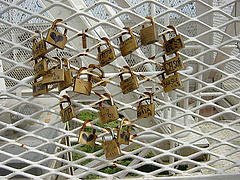 : Lock of Love. I was having breakfast with my little darling in a coffee shop, when a sales peddler selling locks approached our table. He was holding various types of lock and insisted to demonstrate his products, claiming they are special in many features. I hesitated him a moment. I spoke aloud without fear, "I only need one type of lock. Do you sell lock of love? A lock to keep me and my sweetheart in love safely forever?" The sales man was puzzled, "Ahhh!! Love lock!! We don't sell love lock!!" Without me realising, the neighbouring customers were also amazed. All ears and attention were on me. I pondered over him, "Yes! U do have those locks. If only you could add patient, kindness, no envy, no boastfulness, no proud, no rudeness, no self seeking, no anger but with truthfulness in them, those locks will sell. Coz these types of love lock always creates hopes and always perseveres." The salesperson and the crowd laughed and smiled. I believed they knew my intention. I had bought the love lock for my little darling. I also wish those who are in love, consider to buy this miracle love lock. It definitely works wonderfully.